Zapya Zapya: The fastest cross-platform file transfer tool. Sharing File! Sharing Fun! Zapya is an app created by DewMobile, Inc. (whose official website is http://www.izapya.com). Zapya has a rating of 4.5 on the Play Store, with 281321 votes. 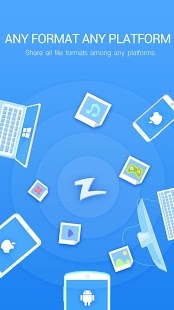 Similar apps are: Share Link (by ZenUI, ASUS Computer Inc.), 4 ShareApps (by 4Share), Automatic Call Recorder (by Appliqato), ShareCloud (Share Apps) (by For2ww), Linterna - Tiny Flashlight (by Nikolay Ananiev), Google Quick Search Box (by Google Inc.), Flash Alerts 2 (by MegaWave Software), 360 Mobile Security (by 360 Mobile Security Limited), CM (Cleanmaster) (by Cheetah Mobile (AppLock & AntiVirus)), Google Translate (by Google Inc.), SHAREit - Connect and Transfer (by SHAREit Technologies Co.Ltd), AppLock (by DoMobile Lab), Xender (by Xender Team), Clean Master (Cleaner) (by Cheetah Mobile). Zapya is currently available in the following countries: Peru, Switzerland, Romania, Israel, Turkey, Thailand, Germany, China, Japan, Netherlands, Denmark, Slovakia, Greece, Ukraine, United Arab Emirates, Poland, Estonia, Chile, Australia, Austria, Singapore, Indonesia, Czech Republic, South Korea, Colombia, Croatia, Serbia, France, United Kingdom, Sweden, Latvia, Lithuania, Norway, Finland, Hungary, Belgium, Hong Kong, Spain, Taiwan, Philippines, Malaysia, Russia, Bulgaria, India, Canada, Mexico, South Africa, Italy, Brazil, Portugal, Argentina, Saudi Arabia, United States, New Zealand, Egypt, Vietnam. 2. Enhance recommending experience in personal profile. 3. Redesign of Transfer History screen. Undelete and recover your lost or deleted photos with DiskDigger!